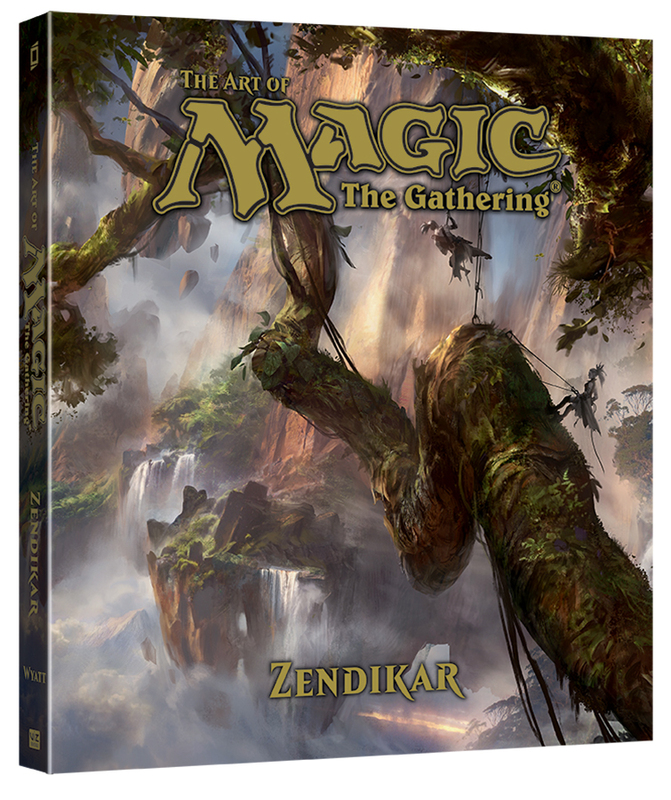 Wizards of the Coast and VIZ Media announced The Art of Magic: The Gathering—Zendikar, an art book featuring images from popular strategy card game Magic: The Gathering. Available worldwide in January 2016, the 240-page book will feature full color illustrations from some of Magic‘s best artists, such as Aleksi Briclot and Adam Paquette, as well as in-depth lore written by best-selling author James Wyatt. Throughout its 22-year history, Magic: The Gathering has visited many richly imaginative worlds through card sets and stories. In its upcoming set, Battle for Zendikar (www.BattleForZendikar.com), Magic returns to the fan-favorite world of Zendikar, where united tribes of elves, vampires, and humans battle the monstrous Eldrazi across strange floating ruins and beautiful landscapes. The Battle for Zendikar card set launches on October 2, 2015. Magic: The Gathering is the world’s best strategy game, with more than 20 million players and fans worldwide. In this innovative card game, players build personalized decks using cards they have collected from booster packs and by trading with friends. Magic offers a robust gaming experience for its community of passionate fans through face-to-face play events and social gatherings in more than 7,000 hobby game stores around the world, complemented by its Magic Duels and Magic Online digital games. For more information, visit MagicTheGathering.com. Wizards of the Coast LLC, a subsidiary of Hasbro, Inc. (NASDAQ:HAS), is the leader in entertaining the lifestyle gamer. Wizards offers players and fans immersive digital and tabletop gaming experiences through its global brands MAGIC: THE GATHERING, DUNGEONS & DRAGONS, DUEL MASTERS and AVALON HILL. Wizards’ games help bring friends, families and communities together through shared imaginative play. Wizards also publishes a fantasy fiction series with numerous New York Times best-sellers. For more information please visit the website at www.Wizards.com. Headquartered in San Francisco, California, VIZ Media distributes, markets, and licenses the best anime and manga titles direct from Japan. Owned by three of Japan’s largest manga and animation companies—Shueisha Inc., Shogakukan Inc., and Shogakukan-Shueisha Productions, Co., Ltd.—VIZ Media has the most extensive library of anime and manga for English-speaking audiences in North America, the United Kingdom, Ireland, and South Africa. With its popular digital manga anthology Weekly Shonen Jump and blockbuster properties like Naruto, Bleach, and Inuyasha, VIZ Media offers cutting-edge action, romance, and family friendly properties for anime, manga, science fiction, and fantasy fans of all ages. VIZ Media properties are available as graphic novels, DVDs, animated television series, feature films, downloadable and streaming video, and a variety of consumer products. Learn more about VIZ Media, anime and manga at www.VIZ.com.